Twelve and a half hours and 620 miles later, I’m in Omaha, safely ensconced in the Hampton Inn catching up on Game of Thrones. The traffic stoppage in Indiana lasted 90 minutes this morning, and I never figured out what caused it. I knew I was in a construction zone, but never saw an actual construction. After an hour and a half of waiting, state troopers came driving the wrong way in the coned-off lane, blowing their horns to wake up the sleeping drivers and get the show on the road. It was smooth sailing after that. Long, but smooth. Traffic moves along smartly here, and I didn’t see a traffic cop all day. I’ve never seen anything like this. A custom made trailer to haul one section of a wind turbine tower. The driver told me he made the trailer himself and it still cost $90,000. There is only 9″ of ground clearance at the front of the huge pipe, although he can raise it if need be. The entire rig weighs 152,000 pounds, or about 50 regular cars. It goes into the wind well, but a stiff crosswind brings the fuel mileage below 1 mile per gallon. The driver does nothing else but deliver these turbine towers around the country, except California because his rig doesn’t pass our smog restrictions and he can’t drive in the state. You learn the most interesting things if you just talk to people. I’m ready to take this trip again, on a much slower timetable. Yesterday I passed by the Indianapolis Museum of Art, which has an exhibition of Dream Cars, the one-off concept cars the auto manufactures design to see what interests people. Today I passed the Iowa Museum of Aviation and the Danish Museum. I need to come back and see all of them, and who knows what else I’m missing. Dinner at Qdoba, a semi-mexican chain near the hotel. After getting all set to order a burrito, I saw the enormous quesadilla somebody else was having and I had to try it. 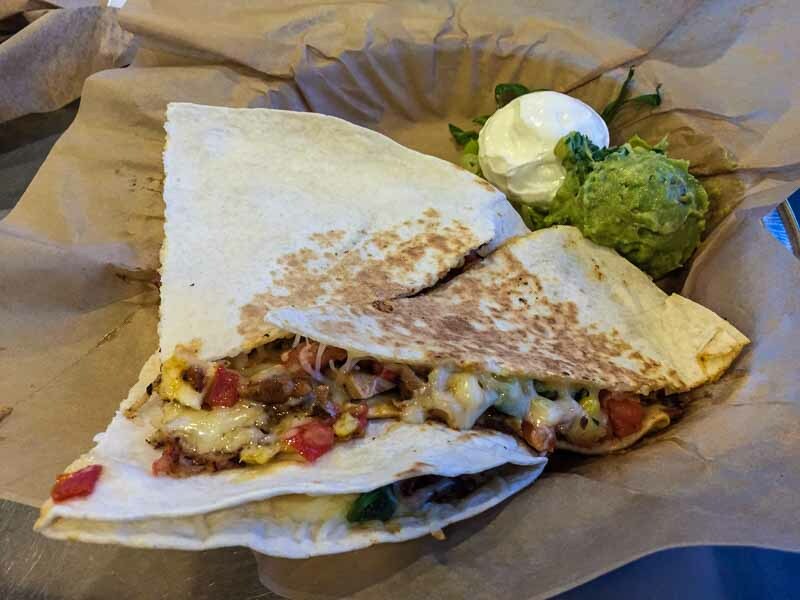 The girl who made it asked if I wanted two sides, and I couldn’t imagine how I could have a one-sided tortilla, it was some kind of zen koan. Turns out she meant did I want sour cream and guacamole. Once again I was too hip for the room. The meal was,let’s say, sufficient. Not really good, not bad. Difficult to eat with plastic utensils and it sticks to the paper it is served on. Qdoba is better than McDonalds, but that’s not saying much. Omaha is much colder than Indy was, and it was starting to rain as I got here. Tomorrow will be another adventure.